Originally scheduled to be held outdoors, the inaugural ceremony was moved to the Council chambers, due to the severe heat. During the City Council reorganization at the ceremony, the Council Members re-elected Ashe-Nadrowski Council President unanimously. 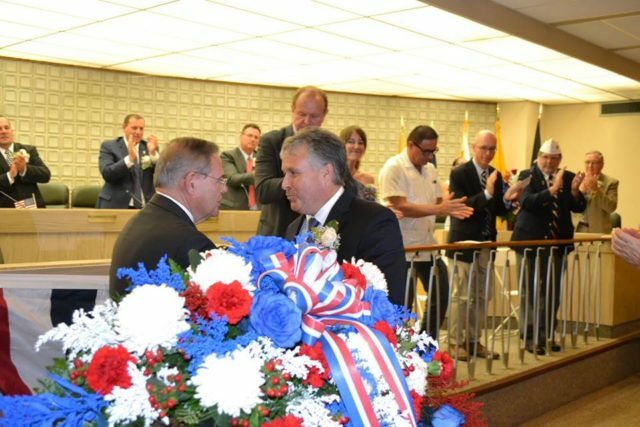 Senator Menendez said that Bayonne “exemplified what America is all about.” Menendez recalled the funding he has obtained for Bayonne during his years in both the House of Representatives and the U.S. Senate. He cited funding for reinforcing the bulkhead around the former Military Ocean Terminal, parts of which were sinking into the harbor. Menendez also mentioned grants for the Bayonne Police Department and Fire Department that he obtained from the federal government. County Executive DeGise called Mayor Davis “a great leader.” Addressing City Council President Sharon Ashe-Nadrowski, County Executive DeGise, a former Jersey City Council President, called being Council President “the best job I ever had.” DeGise said that Mayor Davis “will have your back.” He called for continuing cooperation between the County of Hudson and the City of Bayonne. In his remarks, Freeholder Kopacz recognized the many current and former officials who were in the audience at the event. At the ceremony, Mike Wilson of Post 19 led the Pledge of Allegiance. Ana Petrillo sang the National Anthem. Rosemary Madera led the singing of God Bless America. Dave “Doc” Watson performed an instrumental version of America the Beautiful. The Friendship Baptist Church Choir sang Every Praise. Before the ceremony at City Hall, there was an inaugural Mass at St. Henry’s Church. Clergy members from various denominations took part in the church service. The Bayonne Police and Fire Pipes and Drums led the congregation from the church to City Hall. In the evening, a celebration featuring music, food, beverages, and fireworks took place at DiDomenico-16th Street Park.